Mazel Tov! You did it! You got through the cleaning, bedikat chametz, the cooking, teaching the kids MaNishtana (they are sooo cute….) and now it’s here – Seder Night. So what do you need to focus on to make sure you get the most out of this special night and fulfill all its special mitzvot? It’s a mitzvah from the Torah to be happy during all of Pesach – Simchat HaChag. The Shulchan Aruch states that on Pesach: “One is obligated to be happy and of a good heart.” So, make sure you try your best to put the worries aside and spending some time putting some energy and focus into being joyful. Pesach can be translated into two words: Pe = Mouth, Sach = Speaks. The essence of Seder night is to speak, telling the story of the Exodus from Egypt, praising Hashem, and educating our kids (and ourselves). It’s one night when we want to be especially careful about what comes out of our mouths. 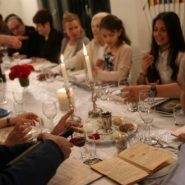 So let’s all try for this Seder night – no Lashon HaRah; no politics; no angry words; instead, only words of praise of all of the Jewish people; love and laughter. (In other words, if they start up again this year, just let it go…). Light your Yom Tov candles with the blessings according to your custom (some wait to hear Shehechiyanu with kiddush). This year, don’t forget it’s also Shabbat. If you can, this a great time to ask Hashem to be freed from all our own personal slaveries, and thank Him for all He gives us. Many women try hard to say Hallel with a blessing before Seder. If you can, that’s great. If not, that’s fine too. The paragraphs explaining Pesach, Matzah, and Maror. The first part of Hallel and the blessing before the 2nd cup (i.e., Everything from “Raban Gamliel says, ‘All who have not said these three things” up until the 2nd cup). Maror – eat a kazayit of maror (about one large piece of romaine lettuce) after dipping it in the charoset, and then shaking the charoset off. Korech – make a sandwich of matzah (the size should be 1/3 of a machine matzah) and another measure of maror. Some don’t do charoset here, others do and shake it off, and some of us lay the charoset on thick. Afikoman – you must eat a kezayit of matzah at the end of the meal (preferably 2 kezatim, but if you’re full, 1/3 of a machine matzah is enough). Birkat HaMazon – You need to bench, and drink the 3rd cup after benching. Hallel – you need to say (or hear) all of Hallel up to the 4th cup, and drink it. Nirzah – you did it! Remember, no more eating until the morning so the taste of matzah stays in your mouth (water is fine, some people are lenient with tea and coffee, but certainly no alcohol). We finish the Hagadah with Next Year In Jerusalem – please G-d you’re going to have a great Seder. But remember, even if it doesn’t turn out the way you’d hoped, every single mitzvah you did on Seder night, every bite of matzah, maror, and drink of wine; every word of Hallel, no matter how tired you were; each and every one of them was a tremendous mitzvah. On behalf of all Am Yisrael – thank you for all you did, Jewish mom. Now go to bed with the knowledge that Hashem took us out of Egypt and made you part of His special Nation – and you, as a Jewish mother, are a major, indispensable builder of His people. That thank you at the end brought me to tears. Thank you for the validation. Just what I needed after the ten hours it took to “turn over” the kitchen!